We became incorporated as a nonstock corporation in December 2015. Most of our activities in the first months of 2016 were focused on organizational matters and strategic planning. During 2016 we held four meetings of our geographically widespread board. The first, our inaugural Annual General Meeting, was an in-person meeting in Washington DC, followed by a working lunch with some JWB authors. The others were conducted by conference call. We elected to board membership Ms. Mona Khalidi, MLS, of New York. We prepared an application to the IRS for 501c3 (tax-deductible) status, meanwhile consolidating our relationship with Virginia Organizing, a 501c3 body in our home-state of Virginia that has agreed to accept tax-deductible donations to support our qualified activities pending attainment of our own 501c3 letter. More information about JWE can be found at www.justworldeducational.org. to educate the public in North America and elsewhere on matters of war, peace, and justice with (for the coming period) some focus on the Middle East. The latter three of these projects will consist primarily of public educational events and forums, to be held in a broad range of cities all around the United States. (The scope of the Online Resources project is, by its nature, global.) Planning for all these projects started in the Spring, and in mid-year we started to roll them out—see below. The U.S. and the World Project. Activities under this project will explore the relationship between the United States and the other 95% of the world’s people, especially in the Trump era. Just World Books’s plans to publish books in Fall 2017 on the United Nations, and on the relationship between warmaking and environmental degradation will provide some focus for these activities. More information about these projects is available on our website, under the tab “Projects”. Launching a richly educational website that would offer resources on the topics of our concern free-of-cost to the global public was an early priority for JWE. In early August the website was launched, at www.justworldeducational.org. The website has already published more than 30 blog posts. All are rich in substance and nearly all are original works of commentary, reporting, or analysis. There are many other multimedia resources on the site as well, including some specially commissioned audio podcasts, maps, and other kinds of resource. Both the content and the organization of the site continue to be works in progress. a public lecture that Daniel gave at the Jimmy Carter Presidential Library in Atlanta. All these events were well attended and provoked searching, informative discussions among attendees. In connection with the GWU event, we produced a short video discussion featuring Daniel, which is available on Youtube. During Daniel’s time in Atlanta, he also did interviews with the local NBC affiliate and with an NPR radio station. 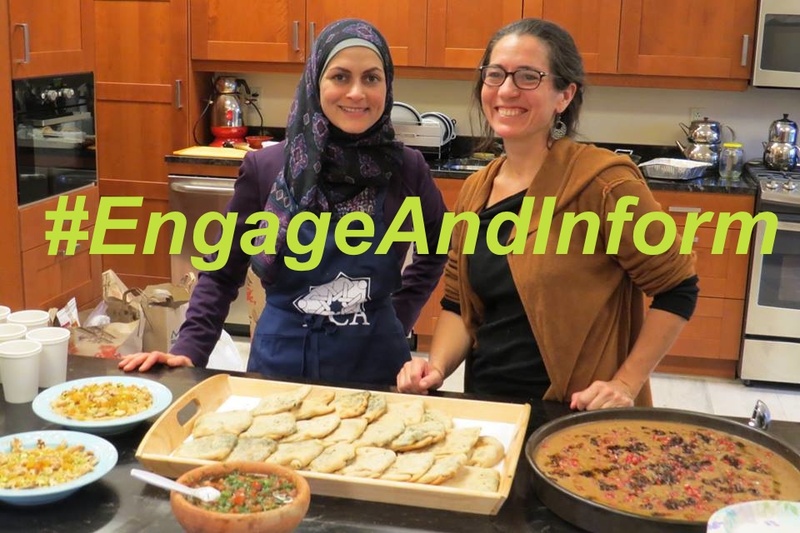 In November, we organized and sponsored a multi-city tour for Laila El-Haddad and Maggie Schmitt, co-authors of the ethnographic cookbook, The Gaza Kitchen: A Palestinian Culinary Journey. The tour started in Lanham, MD, where the two experts led a cookery demonstration and a community discussion hosted by a prominent Muslim-American cultural center. 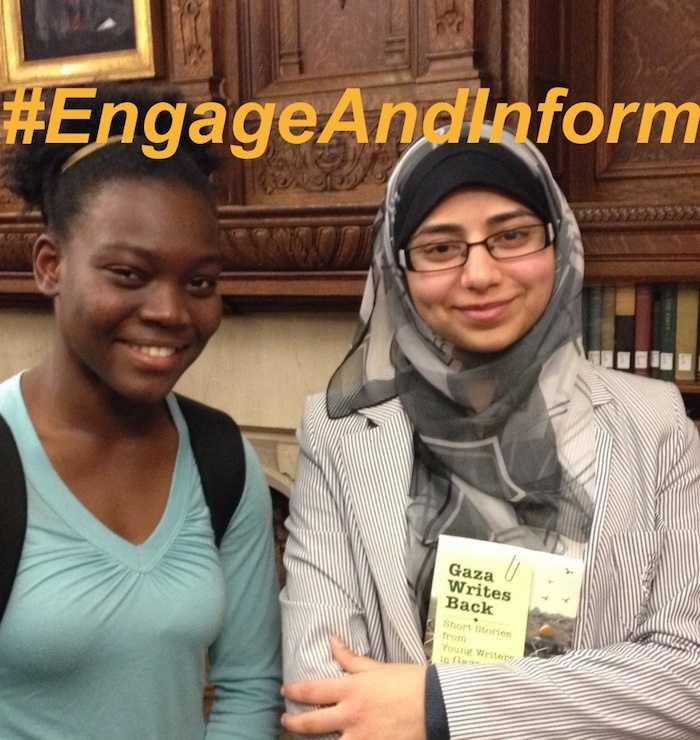 In Washington DC, they led a public discussion at the Library of Congress. In Boston, they took part in an excellent, two-hour panel discussion on Gaza’s food system and the current severe threats it faces, hosted by Boston University’s Department of Food and Wine Studies, and a more informal series of conversations hosted by a local restaurateur. The capstone to their tour was a series of three events on the culinary heritage of historic Palestine, that were held at the Metropolitan Museum of Art in New York, held in conjunction with the Met’s wonderful “Jerusalem 1000-1400” exhibit. The first two were ticketed dinners at which Laila and Maggie spoke along with the British-Israeli restaurateur/author Yotam Ottolenghi. The third was a private tour of the exhibit followed by an informal reception in the Members’ Gallery where Laila and Maggie talked about the food culture of Jerusalem and the rest of Palestine in the medieval period (see photo). This is a broad project area, in which most of the events we’re planning will take place in 2017. We undertook a small portion of this program in mid-November 2016, supporting a speaking tour that Lillian Rosengarten undertook in Northern and Southern California. Ms. Rosengarten took some of the lessons from her memoir Survival and Conscience: From the Shadows of Nazi Germany to the Jewish Boat to Gaza to two very well-attended campus events in SoCal, and then to two community groups in the Bay Area. JWE is planning to work with Just World Books to bring Larry Derfner and Mohammad Sabaaneh to the United States from their homes in Israel/Palestine to conduct educational events around the subjects covered in their books. JWE also plans to sponsor a number of other educational events in various cities with Rothchild, Rosen, and the other JWB authors. From late Spring on, we’ll be mounting what we hope will be a large-scale project called “Palestinian Milestones 2017: Looking Back, Building Forward”: a number of one-day conferences, or four-part seminar series, in which participants will explore the meaning of the many significant anniversaries the Palestine Question will witness in 2017. You can see more details of this project here: http://bit.ly/pm-17. We’ve been very excited about the reactions we’ve received to our outreach and planning for the PM-17 project. Various activist groups and coalitions around the country have started to inquire how we can help them organize a PM-17 conference in their cities or with their networks. We are also in discussion with the NGO Working Group on Israel/Palestine at the United Nations about holding some kind of kick-off event for this project under their auspices, at the UN Church Center in midtown Manhattan, possibly in late April or May. Less than one year into our existence, we feel we have built the basis for an innovative and strong organization that through its web-based activities and its focus on public, in-real-life educational events can make a distinctive contribution to expanding the discourse on issues of war, peace, justice and the Middle East. We’re fortunate to be able to build on many of the capabilities and US-wide networks previously established by the Just World Books team, as well as on the capabilities and networks of our distinguished board. 2017 looks set to be a crucible year regarding the issues of our concern. We’re confident that our educational activities can have an increasing impact on U.S. attitudes regarding these issues. But we will need to hire at least two more full-time staff to realize our plans and we’ll need to bear many costs for travel, communications, media outreach, and logistics. Our current budgeting plans, still in development, indicate that we’ll need to raise between $200,000 and $250,000 to realize our plans for 2017. We much appreciate all the help you can provide. Bring engaging voices from Palestine, and from the Israeli peace movement, to speak in cities around the U.S. in 2017. Produce informative and accessible study-guides for the “Palestinian Milestones” project. Do great outreach to a broad range of media around our speaker events. Update and upgrade our website and help us do strong social media with its content. We’re delighted to have a Memorandum of Understanding with Virginia Organizing, a Charlottesville, Va.-based 501c3 organization that accepts grants and gifts on behalf of JWE. To donate online, go to V.O.’s donation webpage at the button below. As you scroll down there, at the prompt for “Select a designation”, be sure to click on Just World Educational. P.O. Box 5484, Charlottesville, VA 22905. 2. SEND US YOUR INPUT! Our goal is to build strong networks of citizens well informed on the topics of our concern. We need your input, your ideas, your hard work, too. If you’d like to synergize with our work or send suggestions for how we can do it better, contact us! 3. HELP US SPREAD THE WORD! It’s really easy to tell your social networks about JWE’s plans for 2017 and our need for support! 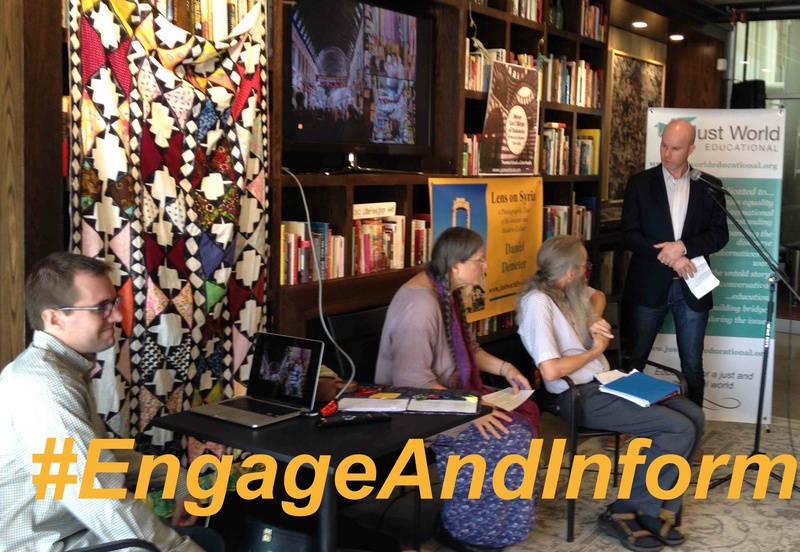 Use the hashtag #EducateAndInform in any social-media posts you write about our plans. Feel free to download some of the following images to liven up your posts, too! THANKS FOR EVERYTHING YOU CAN DO!